Your spotlight feature is very effective Pat and that corners die element is extremely pretty. Hope you have a good weekend and keep warm. Lovely, pretty card. I like the flower image. I think I might give this technique a try. 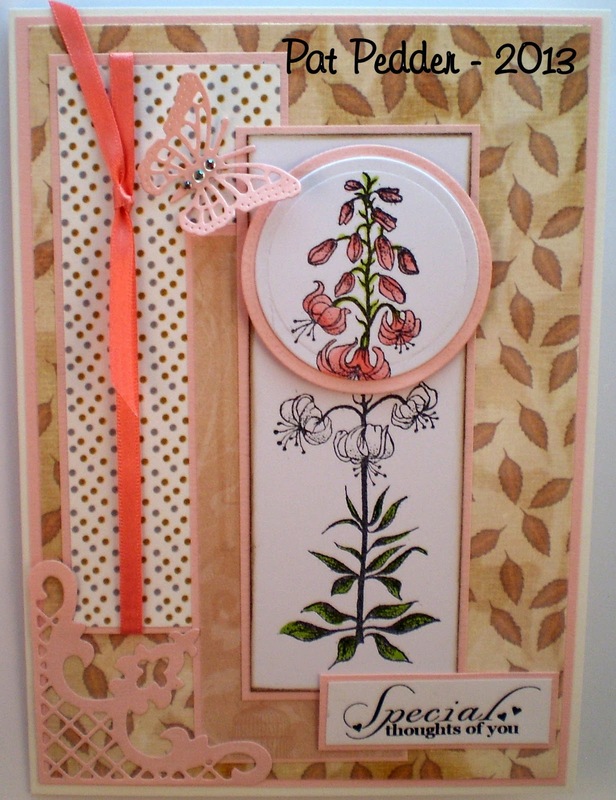 Beautiful card Pat, I love this stamp and how effective it is "in the spotlight". Lovely layout papers and such a pretty corner die. This is lovely Pay. What a beautiful stamp and it's perfect for the spotplight technique. A lovely design too. 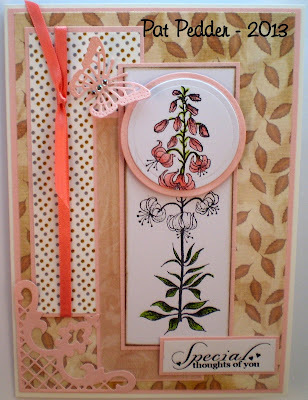 I've seen this technique before and you have nailed it - your card is gorgeous and I love it. Thank you for dropping by to see me and leaving me some very much appreciated comments. Wow Pat this is so beautiful, I have never tried this technique before but it looks fantastic so I may well give it ago, that image, the papers and design are super duper. So beautiful Pat, love the spotlight technique...must give this a go sometime. Have no idea how I missed that tutorial but I did so thanks a bunch for the link. Going to give it a try. I love this card Pat, the layers, the new technique, and your wonderful coloring. "Hugs"
Pat this is really pretty, love the image and your colours and papers are so pretty. Very nice and so pretty! Such a fun technique! Thank you for playing along with my Flutter By Wednesday Challenge! This is gorgeous Pat, I love your colours. Love these colors, Pat! Beautiful spotlight! Oh so beautiful -- you are talented! As you will be able to tell I am trying to do a little catching up! !